When we found out we were pregnant, finding a birth photographer was not even on our radar. It never occurred to us that we would want to have photo documentation of anything but our beautiful baby once she arrived. That absolutely changed once we saw the beautiful way Brittany captures the journey through labor and priceless first moments of life. We were so enamored with the images we saw of others’ births, that we couldn’t wait to have her be there with us on our journey. Brittany was beyond amazing before, during, and after our birth. She met with us to learn more about us as a couple and our road to parenthood. This was so crucial to her being able to tell our story in a way that was meaningful to us. She eagerly got up in the middle of the night when labor began to ensure she was able to photograph labor at home before heading to the hospital. Brittany was always discreet and knew just the right place to be to get beautiful shots without being in the way of us, or the medical team. After birth, she captured the priceless reactions of our families when they met our daughter for the first time, and even came to our house a few days later to take some photos once we’d settled in. The resulting photos beautifully tell the story of when a couple became a family. The time Brittany took meticulously choosing just the right images to capture the emotion in each moment, and putting them together with just the right music, resulted in a video that made us, as well as friends and family, weep with joy as we watched. We are beyond grateful for the time and care Brittany took to ensure we are able to remember our birth as the transformative and powerful experience it was. Our entire family was so delighted with the photography done by Brittany Knapik on the day of our twin daughters' birth. Brittany demonstrated professionalism and creative talent that makes her work stand out among other photographers. Not only was she available at a moment's notice, Brittany was extremely flexible and let us dictate how much or how little of the birth experience we wanted to be documented. She was respectful of privacy, yet was able to capture the most intimate moments. Brittany is so good at what she does, you do not even realize she is in the room. She does not try to stage anything or suggest any poses; she uses her talent and artistic eye to capture the raw, authentic emotions of the day. It takes a specific level of creativity to recognize beauty and sentiment in the minor nuances of a baby's birth, and Brittany definitely has it! Some of our favorite pictures were of the small details: a tissue in a joyful grandmother's hand, a father's hands in his pockets as he waits anxiously, or a baby's tiny toes spread out while being held. Brittany has created a product for us that we will cherish forever. One day in the future, when we show our daughters these photographs, they will clearly see how much their birth was anticipated and how abundantly they are loved. Thank you, Brittany! Brittany has photographed many wonderful moments in my life- my daughter, a few days after we brought her home; my daughter again for her first birthday and cake smash and also a maternity shoot for when I was pregnant with my son. It wasn't a difficult decision in the least to have her take pictures of my son's birth- in fact it felt completely natural. What I didn't realize is that I wouldn't be just having a photographer by my side, I would have a friend and supporter. When I wasn't able to VBAC for my son's delivery and had to scheduled a C-section, that didn't stop Brittany from wanting to be there to shoot as much as she could. At first I wondered what the point would be. 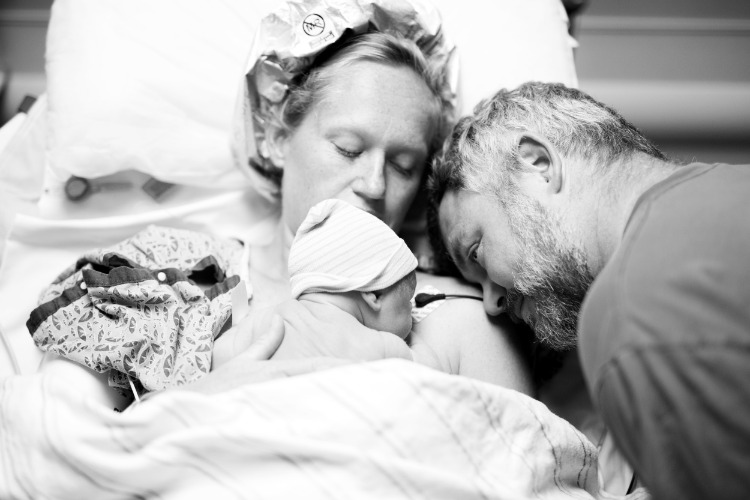 She couldn't access the operating room and would miss the actual birth of my son, but she reassured me that the images would still capture his birth story. She was absolutely right. I look back at those pictures with such fondness as I relive the day that my son made us a family of four. Brittany can capture joy and beauty in a way I never thought possible. She brings to life moments that may get lost in the haze and busyness of birthing a child so that you'll never forget a second of such a momentous occasion.